Three CVPA Faculty in Transcending Text exhibition – Reception 8/30/13 at 5 p.m.
Join us for the exhibition Transcending Text, which brings together four artists who explore the disconnection between text, language and meaning. The exhibition will be shown at Walter E. Terhune Gallery at Owens Community College. 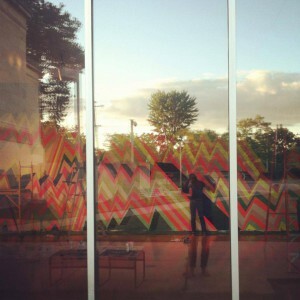 Our closing reception will be held on Friday, August 30 from 5-7 p.m. The Terhune Gallery is located on the campus of Owens Community College, at 30335 Oregon Road, Perrysburg, OH 43551. Barbara WF Miner’s encaustic paintings use shape and repetition to reference abstract symbols: letters, characters, cuneiforms and hieroglyphs. When a letter or a pictograph is separated from the rest of the communication system, it becomes unintelligible and is cast adrift from concrete meaning like a discarded implement. It is then critical for the viewer to create content and investigate the actual painting surfaces and structure for deeper resonance and substance. 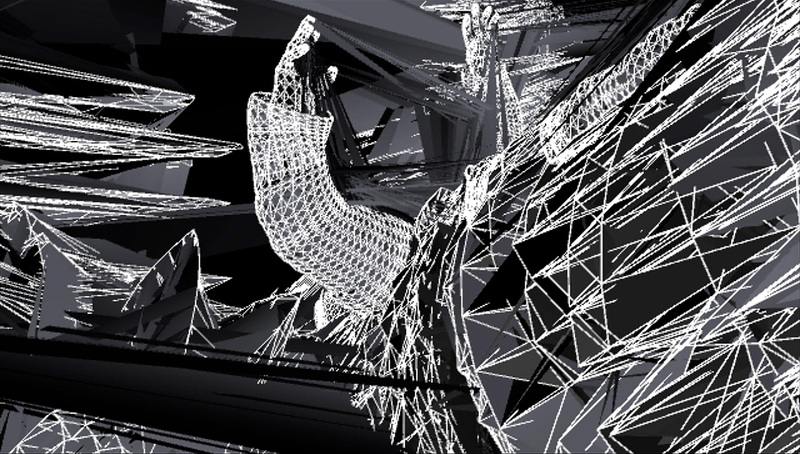 Holly Hey is an “undependent” filmmaker and an experimental weaver of media who strives to undermine conventional methods for telling stories via the moving image. She is currently an associate professor of film and video production within the Department of Theatre and Film at The University of Toledo. She holds a MFA in filmmaking from the School of the Art Institute of Chicago and a BFA in photography from Ohio University. Her films and videos have shown at the Autumn Lights Festival -Los Angeles, the Mix Festival -New York, the Onion City Film Festival -Chicago, the Denver International Film Festival, the Athens International Film and Video Festival, the Vancouver Queer Film and Video Festival, among other venues. For additional information about Transcending Text, email Lee Fearnside. An upcoming exhibition of prints at the Wolfe Gallery at Maumee Valley Country Day School, titled 2013 Impression Printmaking Exhibition will feature the work of college art students and their professors. The University of Toledo will be represented by works from Associate Professor of Art Arturo Rodriguez, BFA student Eric Broz, and recent BFA graduates Lisa Franko, David Folck, Kevin Leiter and Hannah Lehmann. Other participants in the show include selected students and faculty from Bowling Green State University, Columbus College of Art & Design and Florida State University. The exhibition is directed and curated by Joseph Van Kerkhove, Adjunct Instructor of Art at Tiffin University. 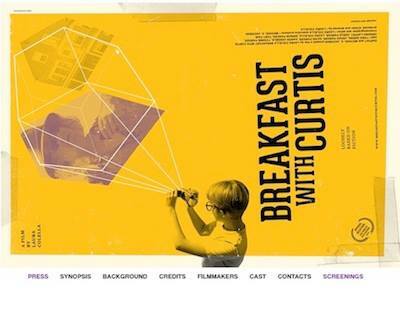 The Department of Theatre and Film at the University of Toledo presents filmmaker Laura Colella and a pre-release screening of her award-winning independent film BREAKFAST WITH CURTIS. The screening is free and open to the public and will occur on Friday, September 13, 2013 at 7:30 p.m. in the Center Theatre of the Center for Performing Arts. The Center for Performing Arts is located on UT’s Main Campus at 1910 West Rocket Drive. BREAKFAST WITH CURTIS centers on the new friendship between troubled teen Curtis and an eccentric bookseller who lives next door. An incident five years ago left bad blood between their neighboring households, but when Curtis gets mixed up with the freewheeling bohemians next door, it shakes up the neighborhood, bringing a season of change for all. At the 2013 Independent Spirit Awards, the film was nominated for a Cassavetes Award and won the Jameson FIND Distribution Award. Learn more about the film at its website. Colella, who has been honored as a Sundance Institute Fellow, will also present a workshop for UT Theatre and Film students during her visit to Toledo. Colella began making films as an undergraduate at Harvard, and was a Sundance Fellow with her second feature STAY UNTIL TOMORROW (2004). She teaches film production and directing at the Rhode Island School of Design and screenwriting at Brown University, and serves as founding faculty chair of Film at Vermont College of Fine Arts. This summer, Colella has been shooting behind-the-scenes footage on Paul Thomas Anderson’s new film INHERENT VICE. Learn more about Laura Colella. 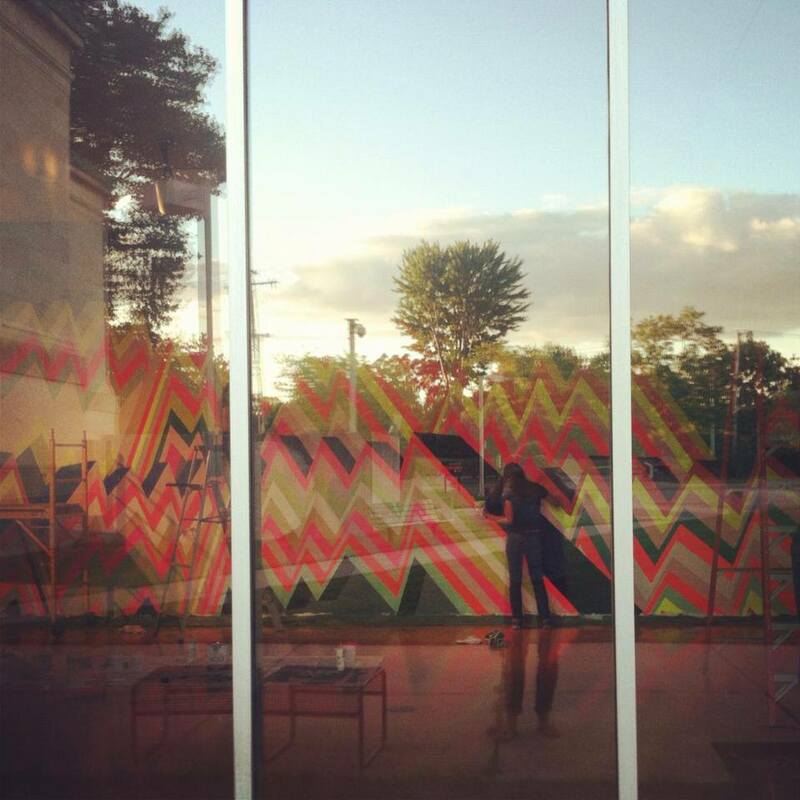 An installation by Natalie Lanese, whose “PANORAMA” will be on display in the CVA Gallery through September 28. 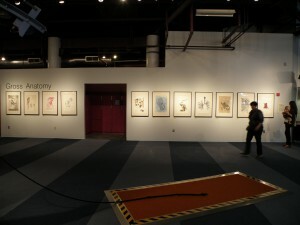 PANORAMA will be on display at the Center for Visual Arts Gallery. The opening reception will be held on Friday, August 23 from 6-8 p.m. at the Center for Visual Arts Gallery. The installation will remain on display through September. Natalie Lanese has recently exhibited at Jack the Pelican Presents in Brooklyn, the deCordova Sculpture Park and Museum in Lincoln, MA, Montserrat College of Art in Beverly, MA, and Scope International Art Fair in Basel, Switzerland. Lanese is Assistant Professor of Art and Gallery Director at Siena Heights University in Adrian, MI and resides in Toledo, Ohio. The Center for Visual Arts is located at 620 Grove Place in Toledo, adjacent to the Toledo Museum of Art. For more information, contact CVA Gallery Director Ben Pond. “More Eyeballs,” “Section of the Neck,” and “Relax” are a few of the 11 works of art by University of Toledo students currently on display at the Imagination Station. Using the book Gray’s Anatomy as inspiration, students in Arturo Rodriguez’s Lithography class and Ben Pond’s Anatomy class collaborated on a large bound book project called Gross Anatomy. Students used lithography as the basis for their initial drawing and then embellished the pages with additional drawing media. 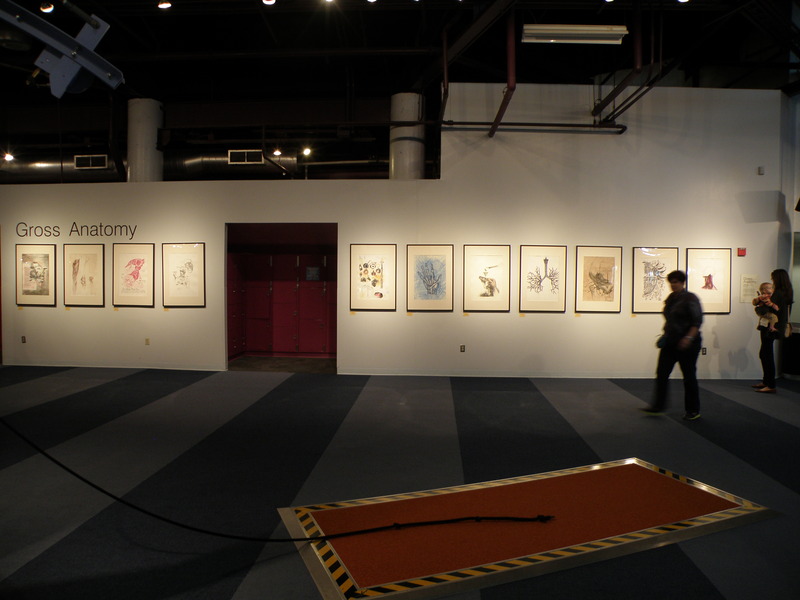 Two copies of the large book were created and another series of prints was made for display. One book was donated to the library at the UT Medical Center, and the other to the Toledo Museum of Art library, where it is currently on view. The project was made during fall semester, 2012. Works on display at the Imagination Station were created by Alyssa Brown, Stacey Cruzado, Sarah Emch, David Folck, Lisa Franko & Wes Rucker, Dylan Gallagher, Katie Heft, Dingzhong Hu, Josh Klein, and Shirley Mei.